Water Street Home Water Infrastructure: A Matter for Homeland Security? Water Infrastructure: A Matter for Homeland Security? November marked DHS’s Critical Infrastructure Security & Resilience Month – thirty days dedicated to specifically raising awareness and creating a deeper understanding of the importance of critical infrastructure to America’s homeland security and economic prosperity. Power, transportation and highways, communication systems and, yes, water infrastructure are front-and-center during this initiative, demonstrating the extremely high value of each one to the health, well-being and future of our country. 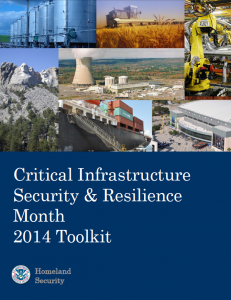 The DHS’s website provides excellent tips, as well as a complete toolkit, for getting involved at every level, in addition to more detail on Critical Infrastructure Security & Resilience (CISR) Month. Security: Keeping infrastructures safe from threats as much as possible. Resiliency: Not just protecting our infrastructure, but having in place a system to provide fast, efficient, “response and recovery” in the face of an attack. Knowing the Enemy: The most common threat to water infrastructure is from Mother Nature! Enhancing security and resiliency means not only protecting water supplies from human attackers, but also man-made accidents, natural disasters, cyber threats and the deterioration caused by aging infrastructure. Shared Responsibility Across the Board: From Federal, State, local and territorial governments, to business and industry, to private individuals, DHS calls upon everyone to take action. This means that in addition to safeguarding their own resources, water utilities need to work with the U.S. EPA, and DHS on an ongoing basis to help develop security recommendations and solutions for the water industry. Utilities should be actively engaged in leading or serving on a variety of national water security committees. Certainly, advocates for protecting and strengthening of our water infrastructure find much empowerment in the fact that water shares the spotlight in this important initiative. But, we also have a responsibility to take a look at how we can support the national effort to strengthen the WHOLE of infrastructure. As the CISR Month community proclamation states, the initiative is not an event, but an OPPORTUNITY for every individual to contribute to homeland security and the prosperity of our country.